You might have used a lot of P2P clients for Windows, Mac or Linux based network computers. P2P client or Peer to Peer client is a software that connects network computers at different parts of the world. Users in the network can download files from other nodes based on availability and speed. P2P torrent clients are now available for mobile phones. Symella is one of the very popular P2P client for Nokia smartphones. 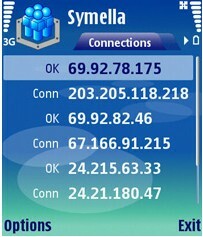 Symella is a Gnutella file-sharing client for Nokia phones. Currently, it is available for mobile devices based on the S60 V3 and S60 V5. In simple sense its a Limewire alternative for Nokia mobile phones. Symella supports multi-threaded downloads which means that if multiple users have a particular file then Symella can download the file from several locations simultaneously. Symella is free (and open source) software, distributed under the terms of the GNU General Public License. If you like this software and want to support the development of Symella by making a donation, you can do so via PayPal at the developer’s site. Though it can be considered as a free mobile Limewire alternative, it many not perform well as you might expect. The reason is simple, less peers and nodes.